Figure 1. 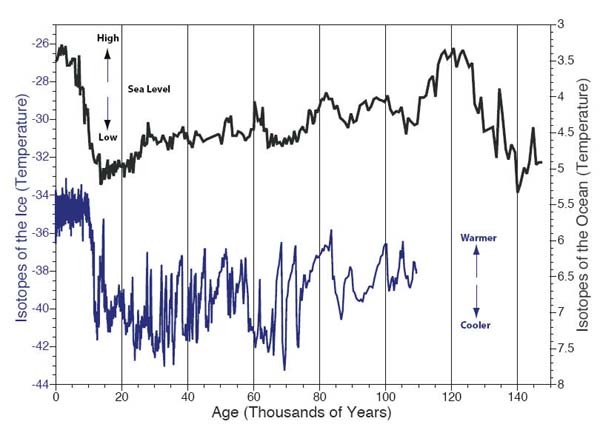 Two records of climate change over the last glacial cycle. The oxygen isotopes of the ocean reflect both sea level and temperature changes. For this site in the Equatorial Pacific (marine core V19-30) the signal is dominated by sea level. The oxygen isotopes of Greenland ice reflect the temperature of precipitation above the core site. There are many more large amplitude and high frequency climate shifts in the ice core record than there are in the marine sediment record. This is because mixing of the ocean sediments by benthic organisms wipes out the high frequency information in this archive. The Greenland ice core record documents that during a glacial period the climate change in 10-20 years, but during the most recent interglacial the climate has been relatively warm and stable. Image courtesy of Jess Adkins, California Institute of Technology.